Android Data Recovery is the world's 1st Android data recovery software. Designed for Android users, it recovers deleted, lost contacts, text messages, photos, call history, music, videos on Android phones and tablets. It supports all Android brands, such as Samsung, HTC, LG, and so forth. Recover 8 types of files: contacts, photos, SMS, videos, call history, music, etc. Work with Samsung Galaxy S6/S5/S4, HTC One, Nexus 7, etc. Deleted the contact of a friend or a co-worker? Wiped all the photos from your Samsung phone by accident? Or a failed rooting killed all of your data? No matter what reasons you lost your Android files, no matter what files you have lost, the bottom line is -- Android Data Recovery is in. You can recover contacts, photos, SMS, call history and videos on all Android phones and tablets. It supports all data loss scenarios: deleting, rooting, restoring factory settings, flashing ROM, and etc. I really appreciate your great product. It helped me recover all the contacts on my Samsung Galaxy S III within minutes. Plus, I love your interface. Thanks again. 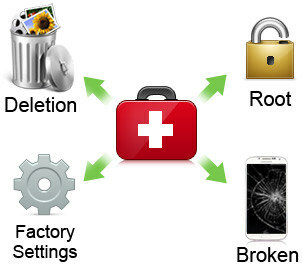 When We need Android Data Recovery? Due to deletion by mistake. Due to formatting SD card used in device. After restoring your device to factory settings. When your device is broken. Retrieve lost contacts including phone number and name, etc. Get back sent &received text messages and outgoing & incoming call history, and export on PC for better viewing and printing. Recover photos, videos and audios stored from SD card inside Android device. Restore documents like PDF, Office Word on your device. Recover other important files you can't afford to lose. 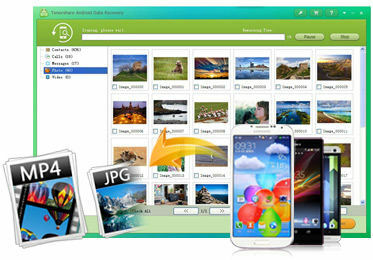 This Android file recovery software supports all Android phones, like Samsung, HTC, LG, Motorola, etc. It works fine with all Android tablets as well, including Google, Asus, Sony, LG, and so forth. It supports all Android device running Android Lollipop and newer, Android 4.4 Kitkat, Android 3.0 to 4.3, Android 2.3 or earlier. You are allowed to preview and check the files if they are your need before recovery. All the lost files are marked in red color. Plus, you can filter to view the lost files only. Only 3 steps within 1 minute, you can finish the data recovery. Built-in guide and user-friendly interface lets you to operate the process more easily. Quite safe. No data damage. No privacy information leaking. Before scan, you can select file types: recover photos & videos or recover contacts, call history and SMS. You can pause the scan process if you found that your lost files have been in scan list. Contacts, call history and text messages are exported in .xls, .xml, .txt files.